The quest for a perfect concealer continues. So, it's time for another installment in my Cover It! Concealer Review Series. Why am I looking for a good concealer? Well, primarily because I am plagued with very dark under-eye circles. In addition to needing a pretty heavy-duty concealer for my dark circles, I also need a good medium coverage concealer for redness around my nose area and on my chin. Often I end up using 2 concealers on my face. A lighter one for concealing redness and a heavier/creamier one for the eye area. 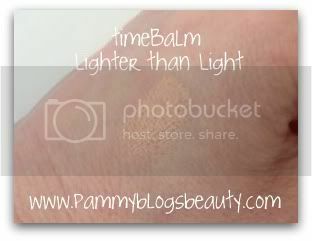 So, the search continues with theBalm timeBalm Concealer, Lighter than Light . 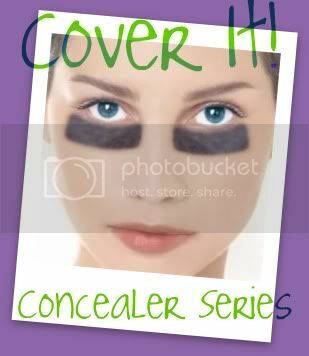 Before trying this concealer I read great reviews about it's effectiveness for dark under eye circles. For my full review, swatches, and photos, keep reading after the jump break. 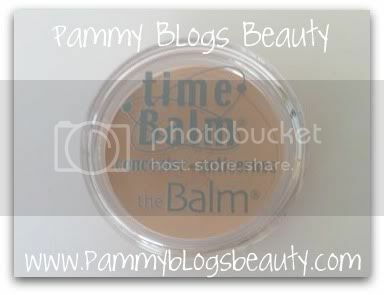 This is a cream style concealer in a plastic screw top pot container. It is specifically marketed to cover dark under eye circles and other imperfections while also being an "anti-wrinkle" concealer. Retails for approximately $18 for a .25 oz container. Claims to neutralize free radicals, brighten, condition, and moisturize. Initially I was drawn to this concealer because of its claims to banish dark under eye circles, the good reviews online, and the availability of a very light shade for my fair skin (very often makeup brands do not have a shade light enough for my super fair skin). Generally, I prefer potted-style concealers for the under eye area. Potted concealers tend to be thicker and are often creamier than stick concealers. Certainly they are much heavier than liquid concealers. Since I am really going for heavy coverage for the under-eye area, I really gravitate more towards potted concealers. Honestly, my biggest complaint about this product is the cheap-looking packaging. I mean, this is an $18 concealer. You would expect the packaging to look much more high end! This packaging looks like something on the cheaper end from the drugstore. The packaging is a clear plastic screw top jar. It reminds me of the type of jar that many mineral shadows come in. But, it is nice that it is clear and you can get a good view of the color of the product as well as see exactly how much you have left. The jar is also non-bulky which is nice. It comes with a little sponge. But, honestly, I lost the sponge right after I got this. So, I never used it. I found Lighter than Light to be a pretty darn good match for my fair skin in the under eye area. For reference I am a NC15 in MAC's Studio Fix and Siberia in NARS Sheer Glow. Concealer matching for the under eye area is tricky as I need a very light shade, but the pigment must be just right to conceal those dark circles. I can often get away with concealers that are much more peach-toned than my skin as I need that peach pigment to counteract my dark circles. This product has just a bit of a peachy tone (very slight). So, the shade really works for me for the under eye area. This product is on the thicker side, but certainly not the thickest concealer that I have tried. The texture is creamy and nice. Definitely a good consistency for the under eye area. It blends well and is build able. On my concealer rating scale, I would judge this concealer to be in the heavy range. It is certainly more pigmented than average. But, not amongst the most pigmented concealers that I have tried. As always, I make sure to apply concealer to a well moisturized eye area. I usually allow my eye cream a few minutes to sink in before applying concealer. When you find a good eye cream, all concealers apply better! I apply this with a concealer brush (usually my Sigma F70 or my ecotools concealer brush) and I build and blend until the coverage is just right. I apply more heavily in the super dark areas of my dark circles and then I blend out with my fingers. After application, I dust on a very light layer of powder to set the concealer. I think this is a necessary step with this concealer as it applies moist. Just be sure to not apply too much powder, or it will cake and settle into fine lines. Well, I must say, that I have do not have wrinkles. So, I can't fully address this. But, this product does contain some beneficial ingredients for the skin. Some concealers emphasize fine lines (my eye area can get a few fine lines when skin is dehydrated or a concealer is too cakey) and this product did not do this. My skin is less dry in the warmer months, so I am curious as to how this concealer will work in the winter when my eye area is much drier. I found this to be a very effective concealer for my under eye area. This product covered my dark circles well and wears all day. I am pleased with the wear of this product. Right now, this is my go-to concealer for my under-eye area (especially if my circles are looking darker than usual). Of course, my hunt for great concealers continues. But, I am sure this is a product that I will use up and eventually repurchase. The shade match is good, the coverage is good, and I like the texture and wear. Thanks so much for reading! As always, I love hearing your recommendations for other concealers that have worked for you and that I should try. I'm also looking for the perfect concealer. I usually have the most problem getting the product not to crease under my eyes no matter how little I apply or even if I powder the product.